BEIRUT — Something significant happened in the last few days of April, but it seems the only person who noticed was Stephen Cohen, a professor emeritus of Russian studies at New York University and Princeton University. In a recorded interview, Cohen notes that a section of the Russian leadership is showing signs of restlessness, focused on President Vladimir Putin’s leadership. We are not talking of street protesters. We are not talking coups against Putin — his popularity remains above 80 percent and he is not about to be displaced. But we are talking about serious pressure being applied to the president to come down from the high wire along which he has warily trod until now. Putin carries, at one end of his balancing pole, the various elites more oriented toward the West and the “Washington Consensus“ and, at the pole’s other end, those concerned that Russia faces both a real military threat from the North Atlantic Treaty Organization and a hybrid geo-financial war as well. He is being pressed to come down on the side of the latter, and to pry the grip of the former from the levers of economic power that they still tightly hold. In short, the issue coming to a head in the Kremlin is whether Russia is sufficiently prepared for further Western efforts to ensure it does not impede or rival American hegemony. Can Russia sustain a geo-financial assault, if one were to be launched? And is such a threat real or mere Western posturing for other ends? What is so important is that if these events are misread in the West, which is already primed to see any Russian defensive act as offensive and aggressive, the ground will already have been laid for escalation. We already had the first war to push back against NATO in Georgia. The second pushback war is ongoing in Ukraine. What might be the consequences to a third? Putin is being pushed to wield the knife — and to cut deeply. In mid-April, General Alexander Bastrykin, the head of Russia’s Investigative Committee (a sort of super attorney general, as Cohen describes it), wrote that Russia — its role in Syria notwithstanding — is militarily ill prepared to face a new war either at home or abroad, and that the economy is in a bad way, too. Russia, furthermore, is equally ill prepared to withstand a geo-financial war. He goes on to say that the West is preparing for war against Russia and that Russia’s leadership does not appear to be aware of or alert to the danger the country faces. What is this all about? For some time there have been indications that a key faction within the Kremlin, one that very loosely might be termed “nationalist,” has become deeply disenchanted with Putin’s toleration of the Washington Consensus and its adherents at the Russian central bank and in other pivotal economic posts. The nationalists want them purged, along with Prime Minister Dmitry Medvedev’s perceived Western-friendly government. Putin may be highly popular, but Medvedev’s government is not. The government’s economic policy is being criticized. The opposing faction wants to see an immediate mobilization of the military and the economy for war, conventional or hybrid. This is not about wanting Putin ousted; it is about pushing him to wield the knife — and to cut deeply. What does this faction want apart from Russia preparing for war? They want a harder line in Ukraine and for Putin to reject U.S. Secretary of State John Kerry’s snares in Syria. In short, Kerry is still trying to force Assad’s removal and continues to push for further U.S. support for the opposition. The American government is reluctant as well to disentangle “moderates” from jihadis. The view is that America is insincere in trying to cooperate with Russia on a settlement and more intent on entrapping Putin in Syria. Perhaps this is right, as Gareth Porter and Elijah Magnierhave outlined. The Obama administration is acting to weaken Putin and Lavrov’s hand, and therefore strengthening the hand of those in Russia calling for a full mobilization for war. What this means at a more fundamental level is that Putin is being asked to side with the nationalists against the internationalists aligned with the Washington Consensus, and to purge them from power. Recall, however, that Putin came to power precisely to temper this polarity within Russian society by rising above it — to heal and rebuild a diverse society recovering from deep divisions and crises. He is being asked to renounce that for which he stands because, he is being told, Russia is being threatened by a West that is preparing for war. The prospect of the seeming inevitability of future conflict is hardly new to Putin, who has spoken often on this theme. He has, however, chosen to react by placing the emphasis on gaining time for Russia to strengthen itself and trying to corner the West into some sort of cooperation or partnership on a political settlement in Syria, for example, which might have deflected the war dynamic into a more positive course. 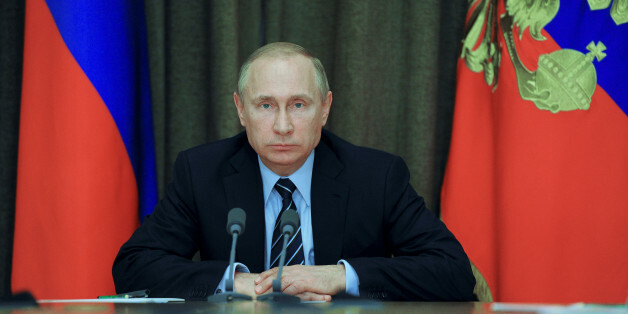 Putin has, at the same time, skillfully steered Europeans away from NATO escalation. … preclude the emergence of bipolarity, another global rivalry like the Cold War, or multipolarity, a world of many great powers, as existed before the two world wars. To do so, the key was to prevent a hostile power from dominating a ‘critical region,’ defined as having the resources, industrial capabilities and population that, if controlled by a hostile power, would pose a global challenge. In an interview with Vox, U.S. Secretary of Defense Ashton Carter was clear that this was broadly the bearing by which the Pentagon was being directed to sail. Then again, there is the rather obvious fact that, instead of the much-touted U.S. military pivot ostensibly being to Asia, the actual NATO pivot is being directed to Central Europe — to Russia’s borders. And NATO is plainly pushing the envelope as hard as it dares, up and against Russia’s borders. Then there is the rhetoric: Russian aggression. Russian ambitions to recover the former Soviet Empire. Russian attempts to divide and destroy Europe. And so on. Why? It may be that NATO simply presumes these envelope-pushing exercises will never actually come to war, that Russia somehow will back off. And that continuously poking the bear will serve America’s interest in keeping Europe together and NATO cohesive, its sanctions in place, divided from Russia. NATO is due to meet in Warsaw in early July. Perhaps, then, the Western language about Russia’s “aggression” is little more than America heading off any European revolt on sanctions by stirring up a pseudo-threat from Russia and that the Russians are misreading American true intentions, which do not go beyond this. Or do they? The extraordinary bitterness and emotional outrage with which the American establishment has reacted to Donald Trump’s probable nomination as a presidential candidate suggests that the U.S. establishment is far from having given up on the Wolfowitz doctrine. So has Putin’s strategy of co-opting America in the Middle East been the failure that the Bastrykin faction implies? In other words, is it the case that the policy of gaining cooperation has failed and that Putin must now move beyond it, because America is not about to cooperate and is, instead, continuing the process of cornering Russia? But here, in this crisis, is an opportunity. America could be heading into recession, corporate profits are falling, huge swaths of debt are looking suspect, global trade is sinking and U.S. policy tools for controlling the global financial system have lost their credibility. And there are no easy solutions to the global overhang of increasingly putrid debt. Trump can simply say that American — and European — national security interests pass directly through Russia, which they clearly do. But a President Trump — were that to happen — can lay blame for any perfect economic storm on the establishment. America is all knotted up at present, as the presidential nomination melee made clear. Some knots will take time to undo, but some could be undone relatively easily, and it seems that Trump has some sense of this. It could start with a dramatic diplomatic initiative. Historically, most radical projects of reform have started in this way: overturn a piece of conventional wisdom and unlock the entire policy gridlock — the momentum gained will allow a reformer to steamroll even the hardest resistance — in this case, Wall Street and the financial oligarchy — into making reforms. Trump can simply say that American — and European — national security interests pass directly through Russia — which they clearly do — that Russia does not threaten America — which it clearly does not — and that NATO is, in any case, “obsolete,” as he has said. It makes perfect sense to join with Russia and its allies to surround and destroy the so-called Islamic State. If one listens carefully, Trump seems halfway there. It would cut a lot of knots, maybe even untie the policy gridlock. Perhaps that is what he intends?